In the beginning, Skank & Shake set out to create an LP - The Long Road Ahead. Months became a year and life eventually got in the way. A metaphorical road block appeared. The Long Road Ahead grew longer, the twists and turns more dangerous and the rest stops few and far between. It was the end of winter, spring came and with the new season, things changed. In 2016, Skank & Shake released their debut work - The Long Road Ahead: Part 1. Seven songs directly influenced by their home - Alice Springs. 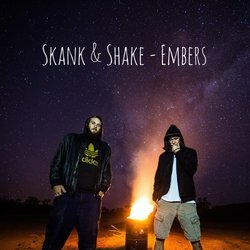 Billed as an Australian first, Skank & Shake have decided not to contain their creativity into one LP, but to document their constant learning and growth through an album with no distinguishable finish: A perpetual album. Embers is a song of reformation. About a cold night out under the stars - it uses themes of growth to convey a message of self actualisation. An underlining theme being the responsible use of mind altering substances for medical and spiritual reasons adds an alternate meaning to the listener.